There are lots of reasons to make your own soap. You can create a safer product than what’s available commercially, and you can save money when compared to products with similar, natural ingredients. It can also be fun! Although no book can include everything, I do wish she had explained more about using milk in soap. She never tells you that you can simply substitute milk for the water in her recipes. Unfortunately, her goat milk soap recipe calls for powdered goat milk, and she adds additional instructions for those who are using fresh milk. But she makes it seem more complicated than it needs to be. 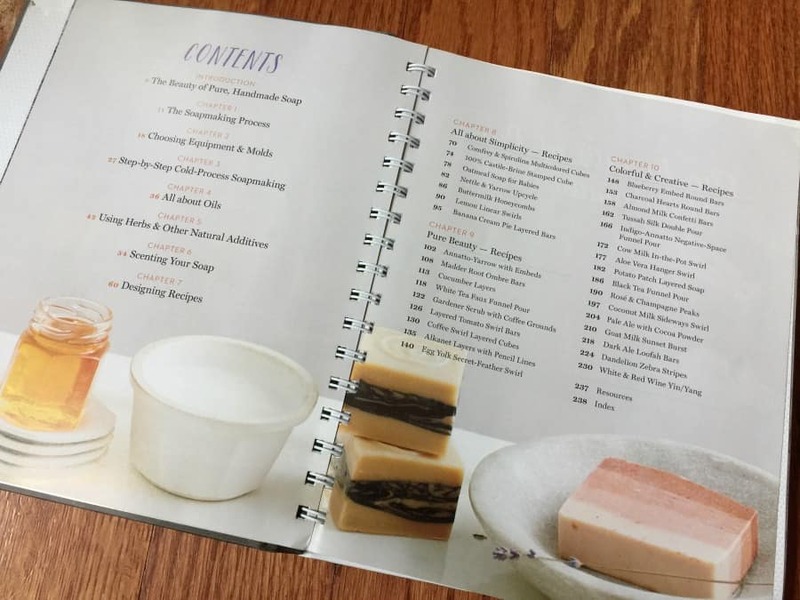 It is one of the more advanced recipes near the end of the book because it actually involves making two batches of soap and cutting up one of them to make embeds. So, I’m telling you now — you can just substitute goat milk for water. The only caveat is that the color will be creamier when you use milk instead of water, so if you want a snow white bar, stick with water. Milk also makes the mixture heat up a little more, so if you ever read a recipe that says it tends to heat up more than usual, it’s probably a good idea to not use milk in that recipe unless you’re more experienced. One thing I found particularly useful was that she includes color photos of what your soap will look like when you use natural colorants, such as cocoa, paprika, spirulina, and more. Years ago I read somewhere that you could create a green bar of soap by using ground up comfrey. I tried it — once — and I definitely would not have called that soap green. The picture in this book does not show a green bar of soap either with comfrey. Spirulina and nettle, however, do make a true green soap. Paprika makes a beautiful orange, and cocoa makes a color that hard to describe (purplish-brown?). Don’t worry, no one will accidentally take a bite out of it. It does not look like chocolate. Even more helpful is that she has two pictures of each colorant — one when it’s fresh and one five months later. Although annatto makes a beautiful yellow initially, it has faded to almost white after five months. 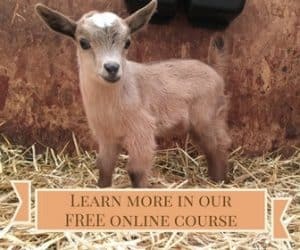 If you want to learn to make soap but are not a fan of reading books, check out the Thrifty Homesteader Academy’s soapmaking class, Coming Clean, which includes a video of making soap with goat milk. This post contains affiliate links to Amazon. That means that if make a purchase after clicking on our link, we will get a small commission while you pay exactly the same price as you would have otherwise. Thanks for your support! This book sounds really nice. Especially the part on natural colours. I never use artificial colour or fragrance. And all my soaps look more or less like cheese 😉 I am soaping in Denmark; when I first began soaping, the Internet was a place where informations flowed freely, not the showcase it is today. After soaping for a while, I remembered reading about a white goat’s milk bar with fresh milk, and I wanted to make this, but learned that the recipe was not longer there, because the person wanted to sell the book instead. As said soaper was based in New Zealand, Tasmania or some place as far away from Denmark, that just was not an option. I became angry and by trial and error made my wery own pearly white goat’s milk soap. It’s easy-peasy. The evening before soaping, you take a third of the water and mix with all the lye. Stir well – it is possible to dissolwe all the lye. Keep refrigerated until next day. And keep the milk (two thirds of water amount) cool as well, naturally. Melt oils etc. (I even use bees wex and have to work above the melting point at 62 Celsius), when oils are all fluid, mix lye water with milk and add to oils. pour as soon as you reach trace and do not isolate, you don’t want gelling. Keep refrigerated if it’s hot in your place. I mostly made do with moving the soap mould ever so often so that the table absorbs a lot of the heat. Thanks for sharing. That’s very interesting, but I just want to caution people about keeping lye water in the refrigerator overnight. Almost every soapmaking accident I’ve heard of happens because someone leaves lye unattended — such as a husband who drank some he saw sitting in a pitcher on the counter or a toddler who pulled a pitcher of lye solution down on top of himself. If you simply need cold water, you can put ice in your measuring container, then add water to the fill line, so you have water that is even colder than the refrigerator would make it. Lye will dissolve in ice water, just as it dissolves in frozen goat milk. However, the less milk you use, the less cream-colored the soap will be. So, using less milk and keeping the soap cold during the first 24 hours to avoid gelling are the two things that make a whiter bar. However, I don’t understand the current fascination with white goat milk soap. Those cream-colored bars are what say to me that a bar is made with 100% goat milk, which makes them more valuable that those made with water or only a small amount of goat milk for marketing purposes. If you are really into the decorative side of soap, I can see that would be helpful for achieving some specific colors. Great review. Have always wanted to try my hands at soap making and never have. 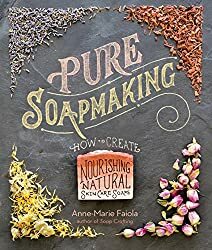 I have looked at several soap making books and even have a few saved in my Amazon wish list. I think this is one of those things that kinda intimidates me and I’m not quite sure why. Maybe I will try my hand at a few batches this winter. Looks like I have more research to do. For me the part that makes me most nervous is working with lye. Logically, I know that when proper caution is exercised, everything should be fine. None the less I feel that doing more research or perhaps finding a local workshop might be the best baby steps into it for me. Assuming you made milk soap — If you saw white floating things, that was fat. Undissolved lye would be bright orange and sinks to the bottom. If it’s the texture of soft butter, you might need to let it dry longer than a month. If you try it, and it gets used up really fast, just let the other bars dry for another month before trying another one. 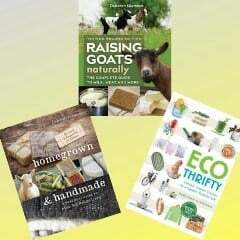 I want learn how to use goat milk from my goats to make soap. I need to make soap again. It’s always that hurdle of mixing the lye. I have done it a couple times, so I’m not sure why I still hesitate at that point. Also would like to know what the different fats achieve. The book sounds very interesting. I am not knowledgeable enough about lye to make soap but would love to learn more about it. Thank you for offering the book for giveaway. I’ve been making soap for a while now. I love how creative it can be and I love how well my skin behaves now that I’m not using commercial products. Besides it’s a great way to us up some extra goats milk. I still struggle with making things “pretty” with multiple colors and swirls. I always end up re-batching when I try and get too fancy. One of these days I won’t be a chronic overmixer. I NEVE MADE SOAP BECAUSE I DINT HAVE ALL THE UTENSILS AN I WANT TO EXPREINCE WTH FRAGRANCE BUT AFRAID I WILL MESS UP. I’ve always wanted to try to make soap, but time and supplies have kept me back. i worry that there’s a lot of up-front costs with molds and ingredients, but I really should try a simple batch and see if i like it! I made soap with my goats’ milk this year for the first time. It was a little nerve wracking, working with the lye, I do admit. I used the directions from Anne Watson’s excellent book on milk soap making. The soap came out a light wheat color. I think it looks quite nice, actually. But the best part was how well it cleans and how soft it leaves my hands. I would love to learn how to add natural color. I am very interested in this! We have been striving for the past 2 years to really go as much “all natural” as we can, but I hadn’t gotten to soap making…until now. I am especially motivated as we are expecting our first grandchild. How I want to make our home as healthy as possible for this precious little new person! The book looks so beautiful! Congratulations! My first grandbaby was born Wednesday! I would like to learn how to make soap, but I don’t want to use lye. Hi Pam — You cannot make soap without lye. It is necessary for the saponification of oils, which is what soap it, by definition (saponified oils). Most of the stuff they sell in the store is not soap; it’s detergent. It is not saponified oils, and you can’t make it at home. If someone says they’re “making soap” without lye, they are not really making soap. They’re doing “melt-n-pour,” which is taking the soap that someone else made, grating it, melting it down, then adding scent or color and putting it into molds. When you read something on the label like “sodium cocoate,” that means coconut oil that was saponified with sodium hydroxide. Sodium palmate is palm oil that was saponified with sodium hydroxide. Back in the day, people only made bar soaps, and they made their own lye from ashes from the fireplace, which I do not recommend because you don’t know how strong your lye is. On liquid soap, you might see something like potassium olivate, which would be olive oil that was saponified with potassium hydroxide, which is the lye that is needed to make liquid soap. Things like sodium laurel sulfate are detergents and are not saponified oils. I have many bar soaps and they rarely get used, does not matter colour, country, scent. what I am looking for is a soap gently enough for dry hands, baby skin, frequent use that is liquid, i.e. can be put into a pump. Too often one has dirty hands and ends up with dirty soap, yuck. Anyone have recipe for oatmeal, goat milk or even a clear gel? If you’re talking about bars of soap that were purchased at the store, they are probably detergents. The only difference between liquid soap and real bar soap is the use of either potassium hydroxide or sodium hydroxide as the lye that is used. Most of my soap customers are actually people with sensitive skin and/or allergies, and some have been buying soap for ten years or longer because it’s the only soap they’ve ever used that doesn’t dry out their skin. My soap is 51% olive oil, which is they key — a high percentage of olive oil. Most homemade soap has a lot of coconut and palm oils because those create a bar that lathers a lot and last a long time, which is good for repeat business from most customers (because they don’t have sensitive skin; they just want a bar that lasts a long time and lathers a lot). If you have really dirty hands, then you just need to continue rubbing the soap until you don’t see any dirt on it. My homemade soap is the only soap we’ve been using on our homestead for 14 years — because we all had dry skin or allergy issues before I started making it, and it works great, even for dirty homesteading hands. I would love to make soap but do not have the ingredients available on the homestead and time is really a rare commodity with all the work involved in getting this run down farm back in production. I never thought I would find so much garbage in the ground no matter where we dig: nails, glass, bottles, metal, ceramic, plastic, rope, wire, bullet shells, light bulbs, chains, bolts, screws, old machinery, old cars, concrete, … I guess prior to municipal garbage disposal people would simply throw things outdoors thinking nature would dispose of it. Luckily the sanitation people take everything we bring to the curb. I have spent weeks on my knees filling garbage bags, a task I had not planned on doing as so many other things need to be done before winter sets in.